When you purchase a pair of hiking boots, motorcycle boots, cowboy boots or other styles, you want to know how to take care of and maintain those boots to keep them looking their best. In fact, the best idea is to learn these maintenance procedures before you even leave the store. It is important to get a manufacturer's recommendation for what will work best for your particular boots. Keep in mind that even if you have purchased a pair of "waterproof boots," most experts will still recommend that you waterproof them yourself before wearing, because the factory waterproofing wears off quickly. Each time you clean the boots, reapply a waterproof seal. 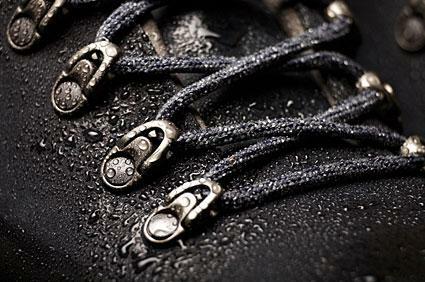 There are several products that can be used for waterproofing your boots. Creams, pastes, oils and wax are options that are applied to the boot then rubbed in. Many boot manufacturers recommend these types of products for best results. Always check the type of material that the boot is made from. For example, combination materials or synthetic boots work best with a water-based wax waterproofer while pure leather can withstand a product such as beeswax. Remove laces from the boots. Clean the boots well with a soft cloth making sure to remove any dirt, debris or dust that may be on the surface. Scoop up a small amount of the weatherproofing product onto the end of a clean cloth. Rub the product into the boot using a circular motion until the boot is completely coated. Allow it to dry overnight or until it is no longer tacky or wet to the touch. For the most effective waterproofing, be sure to get ample product into the seam area where the sole meets the boot. Use a toothbrush, Q-Tip or soft scrub brush to work the product into the seam. Do not use a rough device because you want to keep the stitching or glue intact. Spray waterproofing products are easy and quick to use. While these products provide protection for your boots, they may need to be applied more frequently than a cream or wax. Most sprays omit fumes so be sure to use in a well-ventilated area away from any flames. Hold the spray can at least eight inches away from your boot then begin spraying. Concentrate on the toe and heel areas since are often the most exposed to elements. Apply to seams and leather soles as well. Use several thin coats of spray rather than one thick coat for best results. Do not soak boots with the product. Allow to dry for at least an hour then repeat. Always test a waterproofing spray on an area that is inconspicuous. Sprays can often darken leather and suede. If you did forget to waterproof your boots and get them wet, follow these steps to make sure they dry properly. Wipe off dirt and mud. Dry in a well-circulated area. Use a deodorizing foot powder or baking soda if they smell once dry. Waterproof the boots after drying them. When drying the boots, placing them indoors in your home provides enough warmth. Do not leave them in the sun to dry, to dry by a heater, or dry them with a hair dryer. This can ruin the boots. Air drying is best. Kiwi Camp Dry Boot Protector: This product, priced around $7, is a spray that consists of a silicone formula. It is easy to use and once dry is odorless. This spray bonds to leather and other materials to provide protection from the elements. Keep in mind that light color materials will often darken or turn a yellowish color so test this first before using on your boots. Obenauf's Leather Heavy Duty Leather Preservative: This product is priced around $10 and not only will protect your boots against water, heat and chemicals but will soften them as well. It provides long-term protection and for best results needs to be applied by hand. It comes in a four-ounce tub that you will scoop out by hand. This can be messier but your body temperature will help melt the product into the boots. If you are planning on being in severely wet conditions, applying two applications will give you the best results. NikWax Waterproofing Wax: This product comes in a tube with a sponge applicator and is priced around $9. This wax is easy to apply and works best on smooth leather boots. It may darken leather so always test it out first on a hidden area of your boots. This product can also be applied to wet boots as well as dry. For added protection, you can remove the sponge applicator and apply it by hand to get better coverage. Red Wing Mink Oil: This product is priced around $12 and comes in a three-ounce tub. It not only adds protection against water but will also soften and condition your boots as well. This oil is made from a blend of mink oil, lanolin, and silicone. It is easy to apply. Just use a soft cloth to work into your boots. This product may take longer to absorb into leather and can darken lighter colors. Those who care about chemicals in the environment will be heartened to learn there is a natural waterproofing agent available. Lanolin is a natural oil found in sheep's wool that helps keep them dry when it rains. It can be extracted from the sheep without harming them. You can often find lanolin such as Now Solutions 100 Percent Pure Lanolin (about $8, available at Amazon) in pharmacies or online at sites. To use, simply rub the lanolin into boots like you would any other waterproofing treatment. A good pair of boots can be an investment that lasts for years. Ensure that this happens by caring for them properly, and waterproofing them as needed. After each wear, consider if your boots need treated again with a waterproofing product or if you need to simply wipe them off and let them dry.